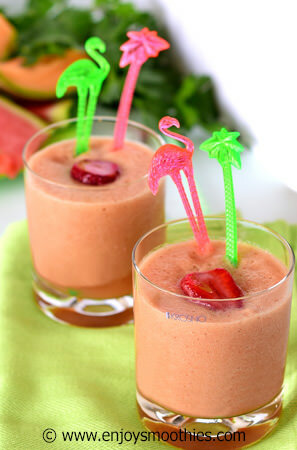 Cantaloupe has many names, such as musk melon, rockmelon or spanspek. As well as having a number of names this fruit has another deceiving feature. On the outside is a rough, scaly skin hiding a sweet, juicy orange flesh on the inside. 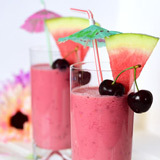 Apart from just eating the fruit, the other great way to enjoy them is to throw them into your blender. 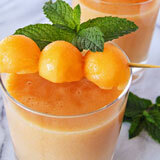 A cantaloupe smoothie is the perfect refresher on a hot summer’s day. 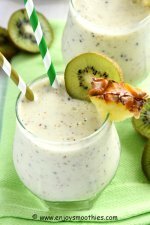 Blend with other melons, nut milks or orange juice for a delicious thirst quencher. Cantaloupe are available from May through to September and are sold either whole or pre-cut in half. When buying look for fruit that is not bruised or damaged. The fruit should be round with no stem, with a depressed scar at the stem end. If part of the stem remains or the base is jagged or torn, the melon is not fully ripe. Cantaloupe have an outer skin that is criss-crossed resembling fine netting. When ripe the pattern should stand out and the netting a creamy-beige color with little or no green. 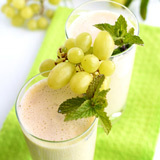 The fruit should also give off a pleasant aroma and give slightly when pressed at the base. If the fruit has large areas that are bruised or soft then it is over-ripe. Mold growth at the base is a sign of decay. Fruit with a deep-orange color have the best flavor. To encourage further ripening, store at room temperature for 2 - 4 days. Once ripe transfer to the fridge. Whole melons will last for a week if kept cold. Cantaloupe halves or pieces, should be refrigerated immediately after buying and used within a few days. The fruit’s rough, outer exterior can harbor bacteria, so it's important to wash the skin before cutting and preparing. This prevents contamination. Scrub with a clean vegetable brush under cold running water. The use of soap is not recommended. The skin of the cantaloupe is porous and soap can seep into the flesh. But it is important to wash your hands after handling with hot, soapy water. 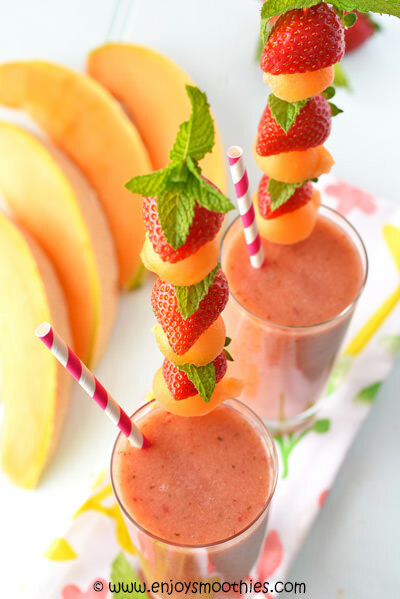 Cantaloupe are high in nutrients and low in sugar compared to other fruits making them a popular choice with weight watchers. One cup of fruit is only 60 calories. 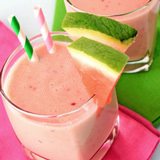 Like other melons their high water content (about 90%) makes them perfect for hydrating during the summer months. Nutritionally, they are excellent sources of vitamins A and C and beta-carotene. In fact one cup contains 100 percent of a daily recommended serve. 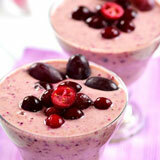 They also contain important nutrients such as potassium, folate, vitamins B and K, magnesium and fiber. Vitamin A is important for clear eyesight, bone and skin health and the proper functioning of the immune system. Vitamin C is a powerful antioxidant that protects the body’s cells from free radicals. Cut a honeydew melon and a cantaloupe in half, then in half again. Remove pips and rind and chop into pieces. 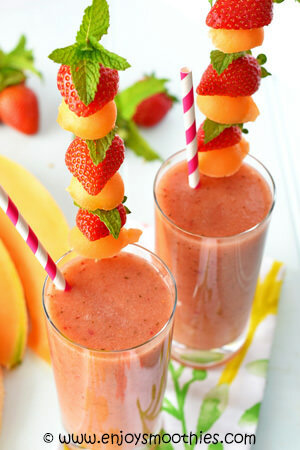 Place the quarters into your blender, along with the frozen strawberries, orange juice and grated ginger. 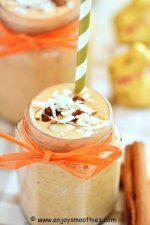 Turn your blender on high and blitz until smooth and creamy. Remove the rind from the cantaloupe and cut into chunks, then simply cut the peach in half and remove the stone. I leave the skin intact for smoothies. 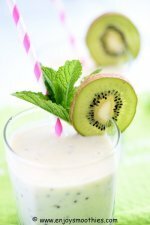 Add to your blender, together with the strawberries, coconut water, lime juice and chopped mint until frothy and creamy. Pour into your two favorite glasses and sit back and enjoy.